When using COLOR 35mm film in the studio or street photography I primarily use Kodak Portra 400. I sometimes use Kodak Gold or Fujicolor Superia X-tra 400 when I want a more affordable option, but I prefer Portra (both 160 & 400). I recently used several rolls during a street photography photoshoot in New York City. After I returned several people commented about trying Fujicolor PRO400H. I investigated the film as I had never used it. Following up I bought 2 rolls of the PRO400H at Roberts Camera and decided to give it a go. However, first a head-to-head comparison with the same camera I used in NYC. I used an Olympus MJU-1 in NYC with the rolls of Portra 400, and it just so happens I have 2 of them. I went out the other day and loaded one MJU-1 with Portra 400 & one with PRO400H. I shot every scene with both cameras back-to-back. I developed the film at the same time using Unicolor C-41 in the same tank. 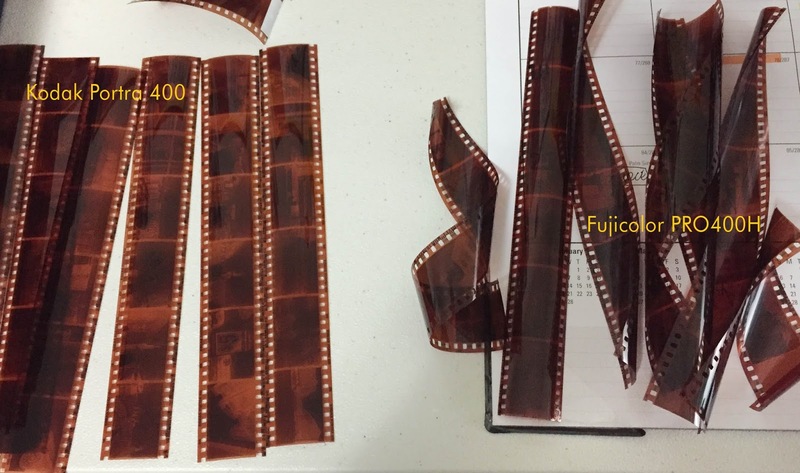 The film dried side-by-side. Finally, I scanned the negatives on the same scanner, an Epson V800 Photo with the same settings. I imported the images into Adobe Lightroom and only cropped, removed dust spots and slighting increased contrast on all of the photos equally. Kodak Portra 400 dries fairly flat but Fujicolor PRO400H curled (corkscrewed) a moderate amount. Since I develop / scan film myself the curling is an issue. My observation is Portra 400 is a bit “richer”. Shadows and blacks seem darker. There appears to be a bit more depth on some of the Portra images. Some of the Fujicolor PRO400H images appear a bit “flatter”. I don’t think I would notice this if I wasn’t looking side-by-sides. Concrete, aluminum & metals appear more accurate with the PRO400H. These textures on the Portra images have a slight yellow hue. PRO400H has a bit of blue in the reds and Kodak has yellow. This was obvious in the photo of the caution cones. Overall, I prefer the Kodak Portra 400. This is mainly because when using film in studio I’m photographing fashion models and the yellow tones are closer to true skin color. Also, I tend to like warmer tones overall. HOWEVER, I think for street photography without a focus on people Fujicolor PRO400H would be better. I think the cooler tones compliment the color pallet in street photography. Bottomline, in my opinion both films are nice, however, the curling of the PRO400H is an issue for me & I prefer a warmer image. Therefore, I prefer Kodak Portra 400. Obviously, your results and tastes may vary. I found the Fuji a bit flat in my shooting too. I like Velvia though and Portra 160 not as much.